The flagship Thomas Haas patisserie is tucked away in a remote crevice of the North Shore not accessible by buses, nor pedestrians – there are no businesses or residences close by. The nearest colony of humans is in a high school a few blocks away. The patisserie is housed at 998 Harbourside Drive in a tiny plaza in a diminutive building large enough for two storefronts. Squarely tacked above one are white block letters: THOMAS HAAS PATISSERIE. Next door is Thomas Haas’ most recent addition, a space for inducing creativity, a test kitchen of sorts. Despite the building’s lack of presence, its name carries weight. The shop’s bustling atmosphere is not born out location. 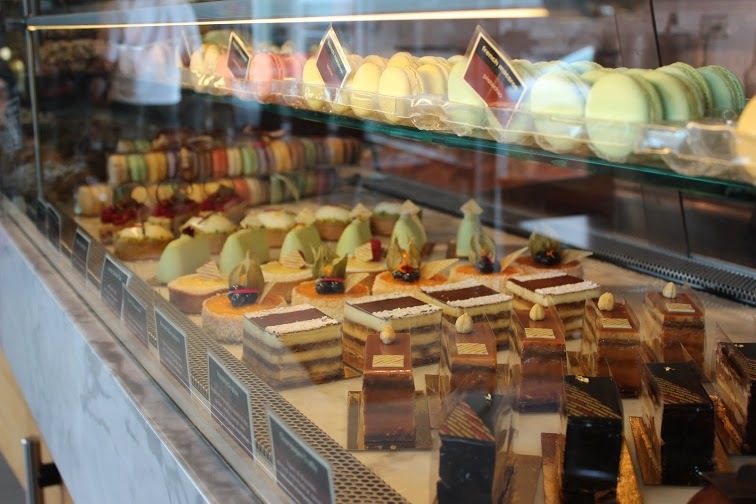 The patisserie’s 500 to 700 daily customers drive and, if they’re lucky, park in the little lot to get their hit of Haas’ coffee and carefully curated confections. On first impression, Haas is uniquely friendly. His friendliness as natural as the sun, not triggered by a need, strategic or reactionary; it’s just there, every day. Our hour-long interview was punctuated with colourful salutations from him to his customers – every one of whom he addressed by name. The shop is small and busy, but never cramped. It is a well-oiled machine and its employees are the wheels and turbines that churn the system, smoothly filtering hundreds of customers through it each day. Haas has fashioned an efficient system of getting his customers in and out as seamlessly as possible, as though the shop had a conveyer belt running through it, guiding customers through his small store. Though he claims he’s not a perfectionist, he admittedly strives for perfection. “If we get a complaint, I cannot sit on it. It goes deep down into my core–somebody not being happy,” explains Haas. In the backend of the shop, I trail after Haas, half-listening to his words curving in a Germanic sing-song cadence, my pupils darting from the trays of decorative chocolates to the oozing fountains of melted chocolate. We stop in front of a jiggling chocolate enrobing machine. 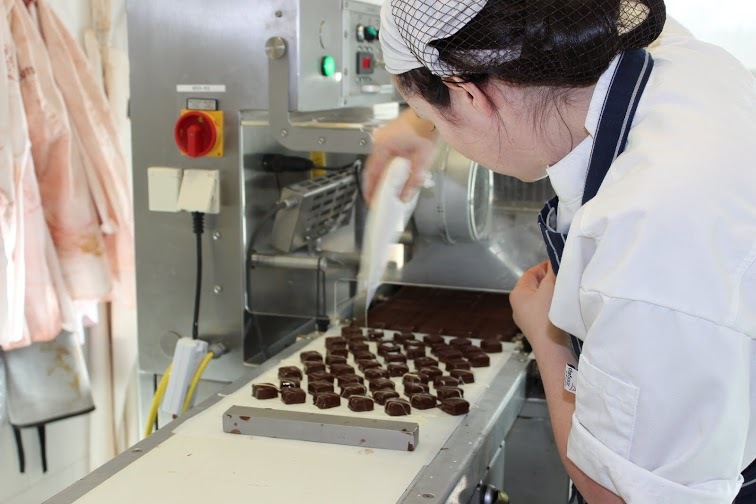 This technology can precisely determine how thin or delicate a chocolate covering should be. Under the tutelage of Haas, young pastry chef disciples are drizzling chocolate, rolling out pastry dough or getting creative while electronic music plays lowly in the background. “Eighty per cent productivity and a lot of laughter, that’s what I want as long as we don’t sacrifice the quality,” remarks Haas. This environment is a far cry from Haas’ early years; at the age of 16 he began the intensive training for Konditormeister, or Master Pastry Chef. 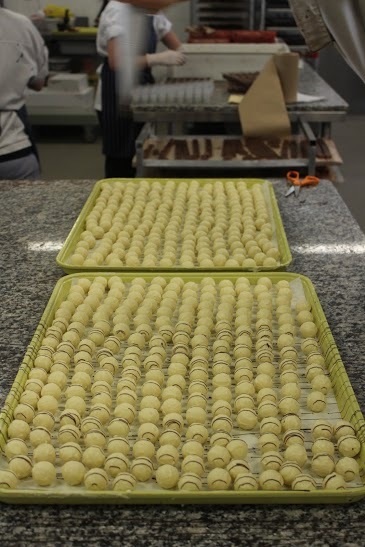 Haas is a fourth generation patissiere from the Black Forest region of Aichhalden, Germany. “When I did my apprenticeship, it was about work. It wasn’t about sitting down and enjoying and getting pleasure out of it. It was about disciplined work – nothing beautiful about it other than hard work,” elaborates Haas. In the front, the glass pastry case spans the length of the shop and positively radiates a plenary of hand-crafted sweets. The myriad of pastel French macarons, sugar-dusted pastries and the signature bite-size Thomas Haas chocolates makes for troublesome decision-making. Seated opposite him in his shop, Haas, wearing his usual white chef ‘s coat, sits with a relaxed air which is in stark contrast to his hectic schedule. Some folks cause your neck hairs to stand; Haas causes you to subconsciously uncross your arms. In the early 90s, Haas was working as the Executive Pastry Chef for a two-star Michelin restaurant in St. Moritz, Switzerland. “It’s the grande dame of all ski resorts, people get flown in on private jets,” he says of the venue. Following the end of the St. Moritz Gourmet Festival, where world class chefs are invited to cook for VIP clientele who pay 10,000 Swiss francs to get delivered to a different hotel every night on a sleigh and eat dinner, Haas was paid a visit by a Four Seasons Chicago chef and their general manager in his pastry kitchen. Their hope was to lure Haas to America and Haas had fantasized about working across the pond. In 1995, Vancouver set the stage for Haas’ North American debut. Soon after, he participated in the North American Pastry Chef of the Year in New York City and finished in the top three in 1997 and 1998. This exposure piqued the interest of famous restaurateur Daniel Boulud, of Daniel, and he promptly offered him a position at his restaurant. “I said to my wife, we just had a little baby, I had a solid job, I said, I have to work for this man. I felt passion and a genuine approach to what he was doing with his craft; I just wanted to work for him. I flew down, got the job, called Lisa and said we’re moving to New York,” explains Haas. In New York, Haas was named one of the top ten pastry chefs in America by Chocolatier magazine and Pastry Art and Design magazine, and appeared several times on Martha Stewart Living and other international television shows. But eventually, Vancouver beckoned. 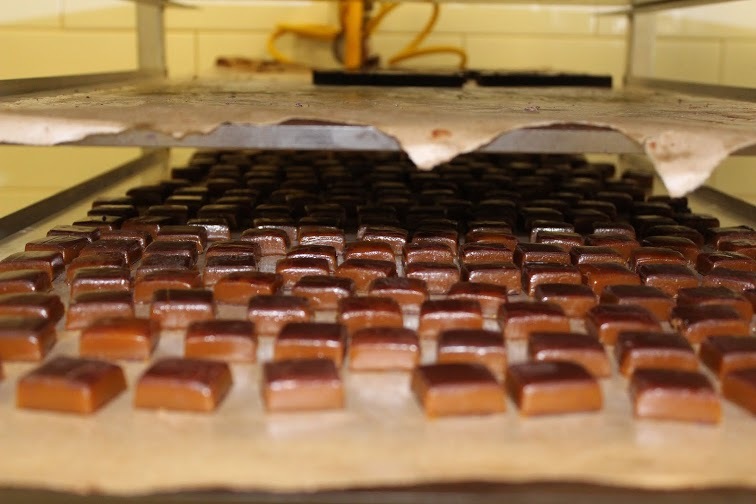 Back on the best coast, Haas and his wife, Lisa, began crafting chocolates for five-star hotels in a pint-sized kitchen. After four years, through only word of mouth, they were supplying the majority of Ritz Carleton, the Four Seasons and opulent clients, like the White House. “I have this image: We’d be working in the office until 3:30 a.m., the kids were sleeping on bubble wrap,” remembers Haas. His continued success, built from his hard work, was evident as the accolades piled up. To name a few, he won first prize in all categories at the Valrhona National (North America) Pastry Team Championships in Los Angeles. The Vancouver Sun Restaurant Awards for best chocolates, best desserts, best croissant and best French pastries. Vancouver Magazine awarded Thomas/Diva at the Met with Best Last Course for the years 2001 to 2006 and pastry chef of the year for 2011, 2013 and 2014. The list goes on. Aside from his professional success, he is a full-fledged Vancouverite who works hard in the winters and plays hard in the summers, revelling in activities like cycling and hiking. He once conquered the Grind in 30 minutes. Those awards are blessed, but it all comes down to one’s first impression of the product. Nestled in my cushioned computer chair, a cup of milky orange pekoe in hand, I sank my teeth into the crispy shell and through the soft gooey center of Haas’ double-baked almond croissant. A decadent blend of toasted almond, sweet marzipan and flaked, buttery pastry coursed through my mouth – which commanded another bite. It was delicious.